Christie’s New York held its Magnificent Tiffany auction on December 19, 2013, with total sales of $1,372,625. Of the 47 items offered for sale, 28 sold, while 19 did not. Sotheby’s was clearly the winner this week, with a finer group of items for sale, as well as significantly higher sales of $3,675,625 in its Important Tiffany sale. 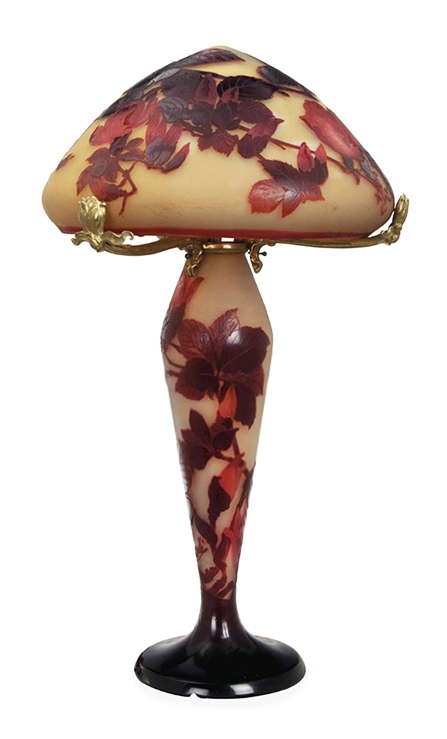 There were some winners in the sale, including lot #135, a fine Tiffany Pony Wisteria table lamp. It sold above its high estimate of $150,000, realizing $221,000, including buyer’s premium. 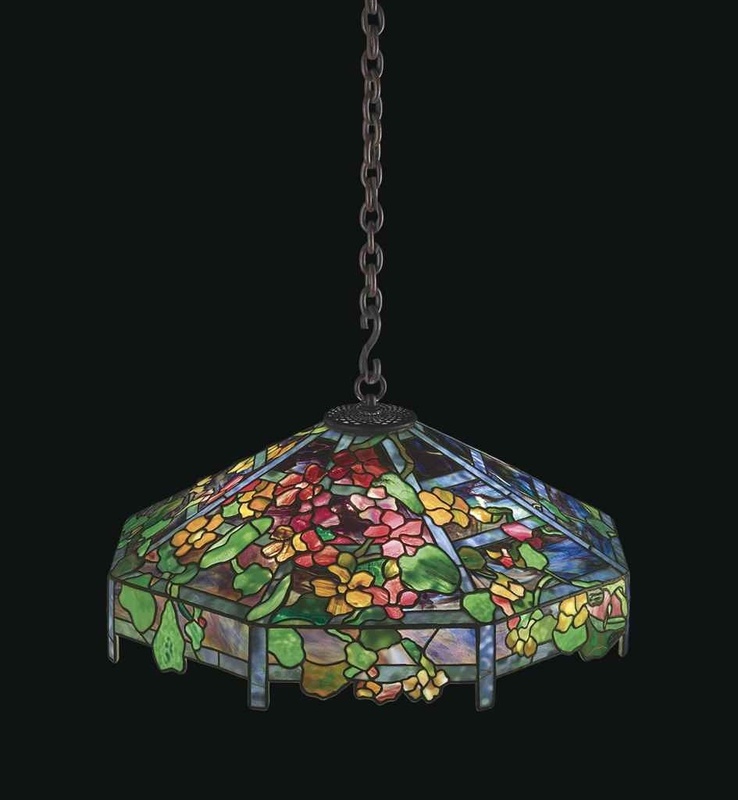 A Tiffany Studios Nasturtium Trellis chandelier brought the second highest price of the auction, $118,750, just below the low estimate. While the results were disappointing, it presented some exceptional buying opportunities. The Tiffany market will rebound, making the buyers at this sale look smart. Every market, including the stock market, takes a breather. It’s the smart money that moves in during those opportunities. 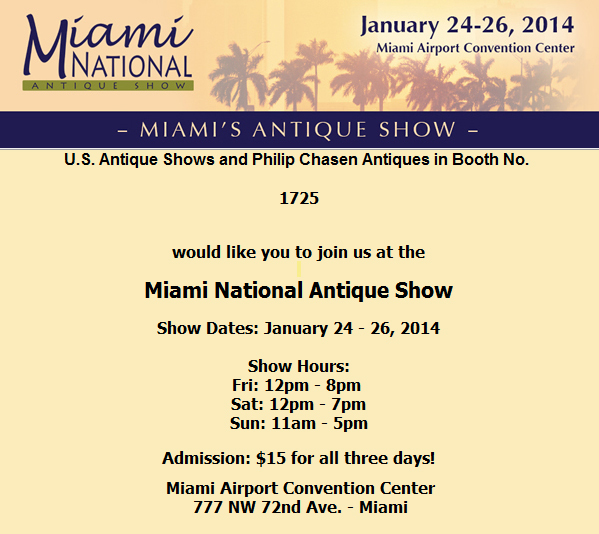 We’ll be busy buying for the next several weeks in anticipation of the important Florida shows, starting with the Miami National Antiques Show on January 24, 2014. We’ll end our winter schedule with the wonderful Grove Park Inn Arts & Crafts Conference, February 21 – 23, 2014. We last exhibited there a few years ago and couldn’t exhibit again because of scheduling conflicts. This year there were no conflicts, so we’re happy to return. It will immediately follow the important Palm Beach Antiques Show. December is 20th Century month, with every major and many minor auction houses holding a sale. Sotheby’s held two sales yesterday, December 18, 2013, with some truly impressive individual results. The Important Tiffany auction realized total sales of $3,675,625, while the Important 20th Century Design sale realized $5,145,500. 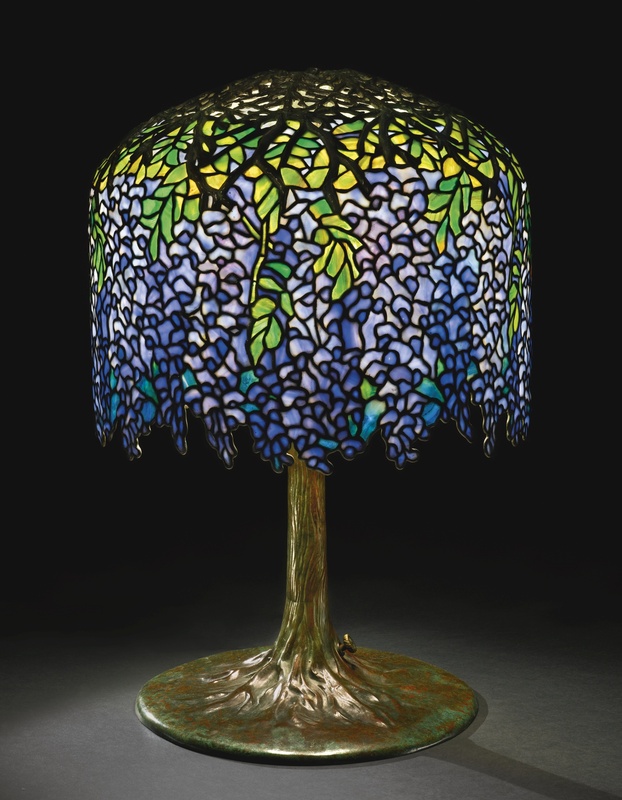 First among the results was a world-record price for a Tiffany Studios Wisteria table lamp at auction. Sold as lot #330, with a pre-sale estimate of $600,000 — 800,000, it soared to $1,565,000, with two phone bidders who wouldn’t give up. The color was strong and the provenance royal, from Baron Heinrich Thyssen-Bornemisza of Spain. 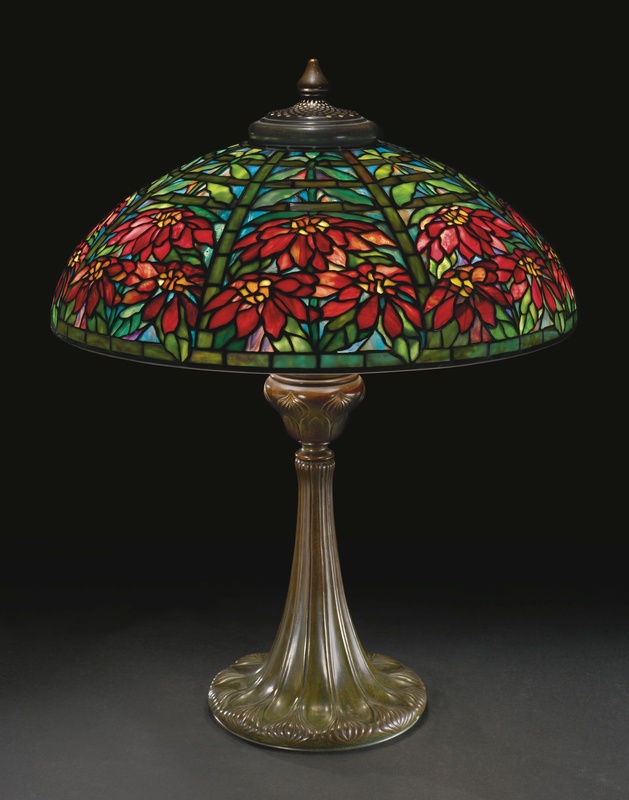 Another Tiffany lamp with a super result was lot #317, a 22″ Double Poinsettia. It was a particularly nice example, with strong red and blue colors — just what collectors like. It sold for $221,000, against an estimate of $120,000 — $180,000. The selection of Tiffany Favrile vases in the sale was limited, but choice. 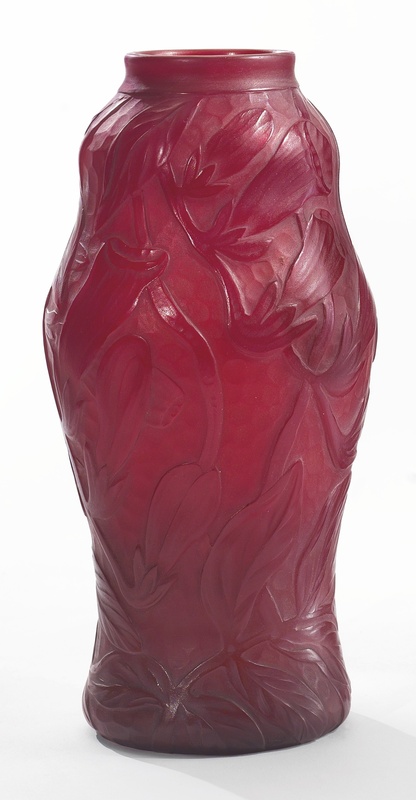 I lusted for lot #304, a fantastic cherry red Tiffany Favrile vase, completely wheel-carved with flowers and leaves. It sold for $21,250, against an estimate of $8,000 — $12,000. Unfortunately, I was the underbidder. There’s only so much a dealer can pay. Retail buyers will win every time. There were some disappointments too. 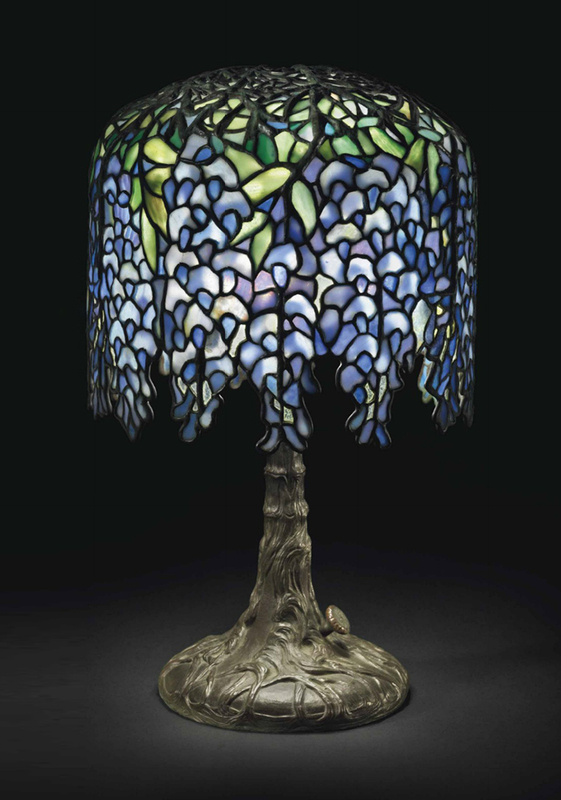 The cover lot, a rare Tiffany Bat lamp failed to reach its reserve of $500,000, against an estimate of $550,000 – $750,000. Another important lot, a piano from Louis Comfort Tiffany’s studio in the Charles Tiffany mansion in NYC, also failed to sell, against a reserve of $200,000 – $300,000. For the complete results of the sale, click here. Tune in Monday for the results of Christie’s 20th Century sales being held today, Thursday, December 19, 2013. Christie’s held their Interiors sale last week, December 11-12, 2013. I last wrote about a couple of interesting French lots in the sale. Today’s post will be about two very curious American lots from the same sale. They’re both interesting, but for very different reasons. Let me explain. Christie’s lot #254 is on the left. A complete vase is on the right. 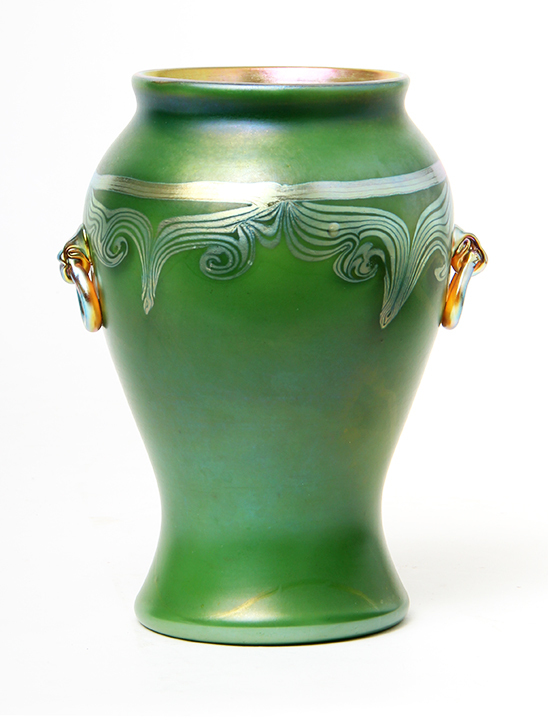 Lot #254 was a rare and very desirable Tiffany Favrile vase, but not exactly this example. You see it was only half a Tiffany vase. Someone, sometime, in its history decided to re-carve the vase into an amusing shape. It’s hard to believe this was done at the factory, so the best explanation is that someone took a seriously damaged vase and became very creative. The workmanship involved in cutting the vase was expert. Christie’s didn’t even think it was an authentic Tiffany Favrile vase, so they called it “AN AMERICAN CLEAR AND COLORED CAMEO GLASS VASE, SIGNED IN ETCH ‘L.C. TIFFANY-FAVRILE’, EARLY 20TH CENTURY”. In fact, if it were complete, it was a killer example. The color was much better than usual and the grape clusters were bigger. Even with the creative carving, it realized $3,125, including the buyer’s premium, against a pre-sale estimate of $1,500 – $2,000. Lot #463, a Pairpoint Hummingbird & Roses puffy table lamp, wasn’t quite as amusing, but still interesting. Why was the lamp photographed with the shade on the table? Take a look at the spider arms. They’re upside-down, so the shade couldn’t possibly rest on the arms. That tickles me. This was another lot that I had hoped to sneak up on. The shade was the larger of two versions, 16″ in diameter, with no chips and a very desirable green background. BUT, I didn’t bid one penny for it. Upon inspection, the interior paint was peeling off the roses — a very rare occurrence. How disappointing! The lamp failed to sell, even with a very fair estimate of $4,000 – $6,000 and a likely reserve of half the low estimate, or $2,000. The paint peeling was subtle, so it probably wouldn’t have been detected in a condition report. This is one bullet I dodged by viewing the item in person. Christie’s held an Interiors sale, yesterday, December 11, 2013, with first day sales totaling $1,796,875. Included in the sale were a few lots of art glass that were very interesting, for different reasons. Let me explain. Lot #252 was a monumental Gallé table lamp, 30″ tall. It was decorated with red magnolias on a yellow ground, using the windowpane technique to keep the flowers red. It was an important lamp that should have been in the main 20th Century sale coming up later this month. It carried a very low estimate of $7,000 – $9,000. I had hopes that it would sneak by so I could buy it for $20,000 or less. It didn’t take long to find out that was a pipe dream. It sold for $50,000, including buyer’s premium, even with a large chip on the fitter rim of the base. But, it was a beauty, and at least two people realized it. Now for the complete opposite. Lot #255 was listed as “A FRENCH CAMEO GLASS TABLE LAMP AND SHADE, THE SHADE AND BASE SIGNED IN CAMEO FOR ‘GALLE’, EARLY 20TH CENTURY”. Now this was a BIG boo-boo that shouldn’t have happened at a major auction house like Christie’s. 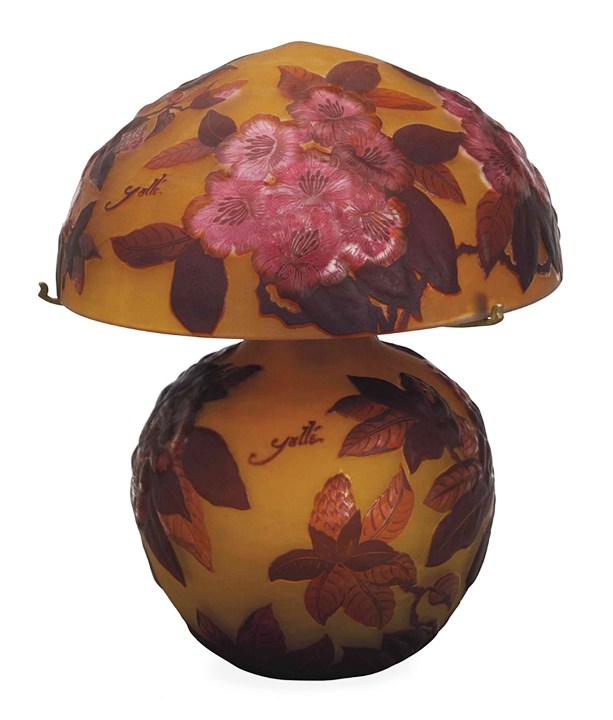 This was a modern reproduction Romanian lamp, signed “Gallé” and also signed “TIP”, which is “type” in Romanian. If you’ve read my lessons on French Cameo Glass, all you had to do was read lesson #5. The lamp was estimated to sell for $4,000 – $6,000, and realized $3,125. If it were authentic, it would have sold in the $100,000 neighborhood. There is going to be one unhappy buyer when he/she finds out. I’m saving two more goodies from this sale for Monday’s post. They are MOST interesting for very different reasons. Tune in on Monday and I’ll explain. 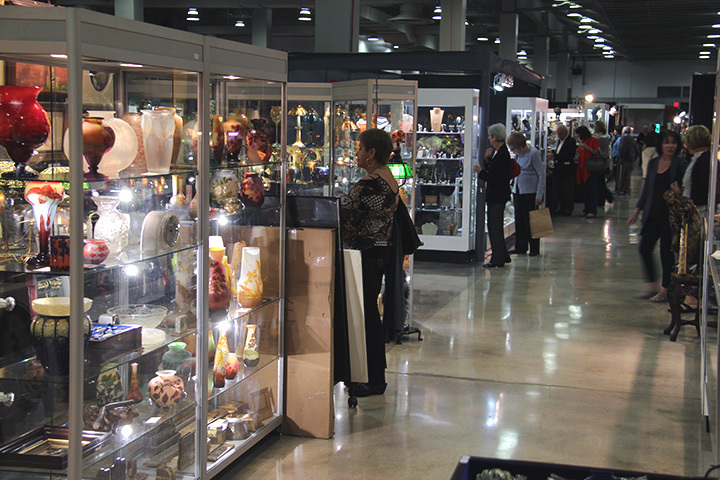 We’ll be busy buying for the next several weeks in anticipation of the important Florida shows, starting with the Miami National Antiques Show on January 24, 2014. We’ll end our winter schedule with the wonderful Grove Park Inn Arts & Crafts Conference, February 21 – 23, 2014. We last exhibited there a few years ago and couldn’t do it again because of scheduling conflicts. This year there were no conflicts, so we’re happy to return. It will immediately follow the important Palm Beach Antiques Show. 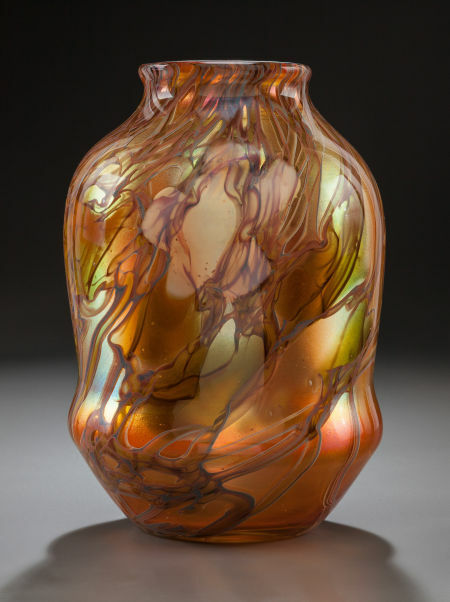 Heritage Auction held a Tiffany, Lalique & Art Glass auction on December 4, 2013. It wasn’t a stellar sale, with mostly B level items, but the results were decent. 344 of the 364 offerings sold, for a high sell-through rate. The sale totaled $1,030,706, for an average of $2,996 per sold item. 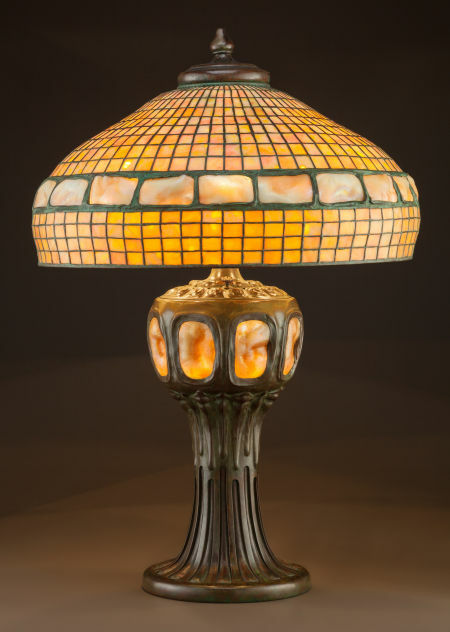 Top lot of the sale was a Tiffany Studios 22″ Belted Turtleback table lamp, with a rare base, in a non-mosaic tile version. When inset with mosaic tiles, this same base is much more valuable. 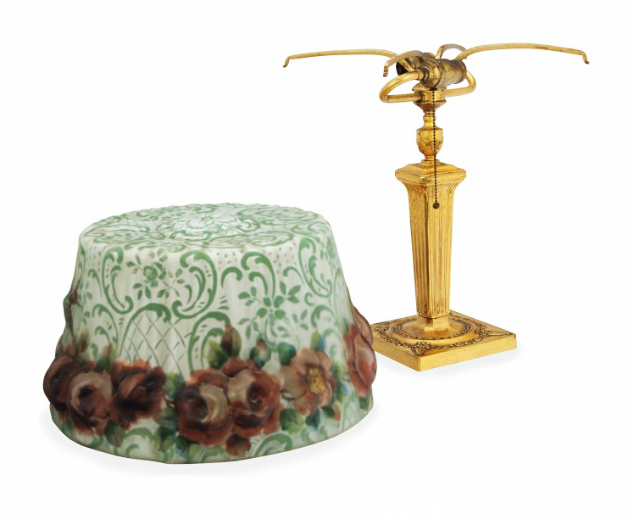 The lamp sold just below the low estimate of $100,000, for a total of $118,750, including buyer’s premium. The consignor was lucky to sell the lamp, as it wasn’t exciting and carried an overly optimistic estimate. The top Tiffany Favrile glass lot of the auction was #89049, a fine paperweight example, purchased in 1978 from Grover Antiques. It sold just below its low estimate of $25,000, for a final price of $30,000. 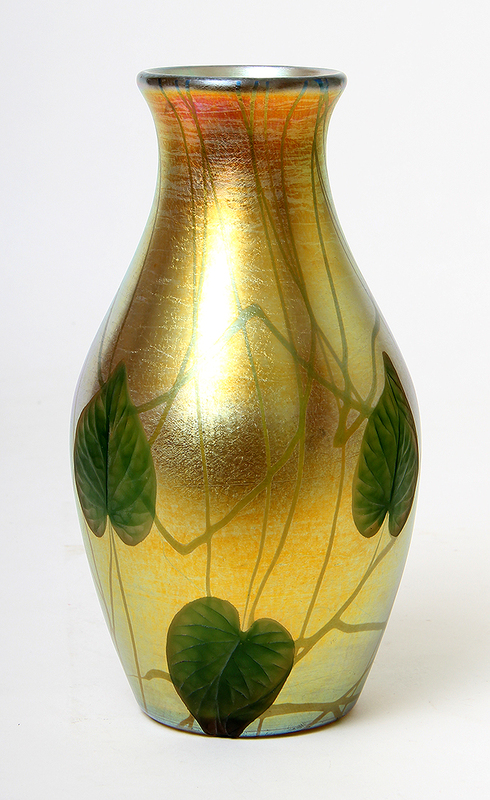 The most interesting lot of the sale was #89172, a rare, desirable, signed Loetz 7″ black bottom vase. It carried a ridiculously low estimate of $1,000 – $1,500. Black bottom Loetz vases have been selling in the $10,000 price range for the last 20 years, so why did Heritage put a $1,000 – $1,500 estimate? Only two explanations make sense. First they didn’t know, or second they did it purposely to generate excitement. Regardless of the reason, the vase soared to a final price of $13,750. For the complete results of the sale, click here. You will have to sign in to get the prices realized. 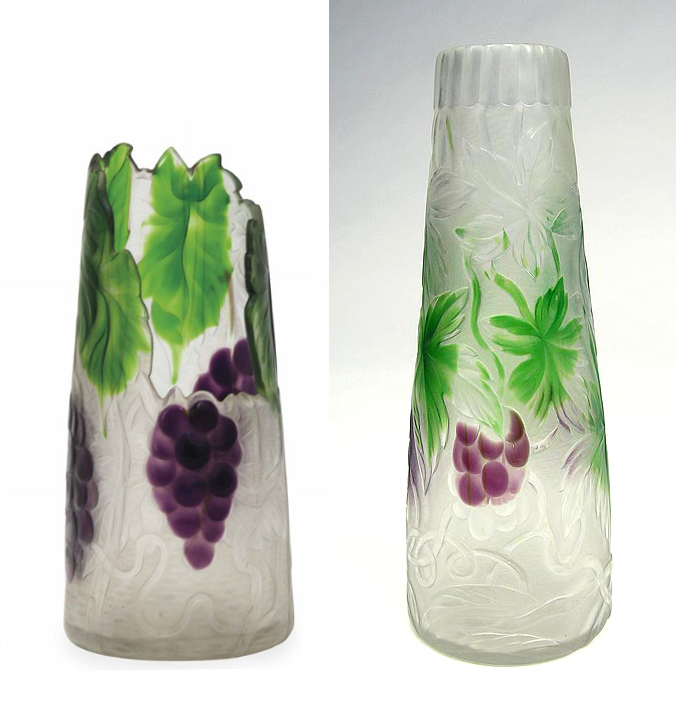 James D. Julia Inc. held their Extraordinary Lamp & Glass auction over two days, November 20-21, 2013. 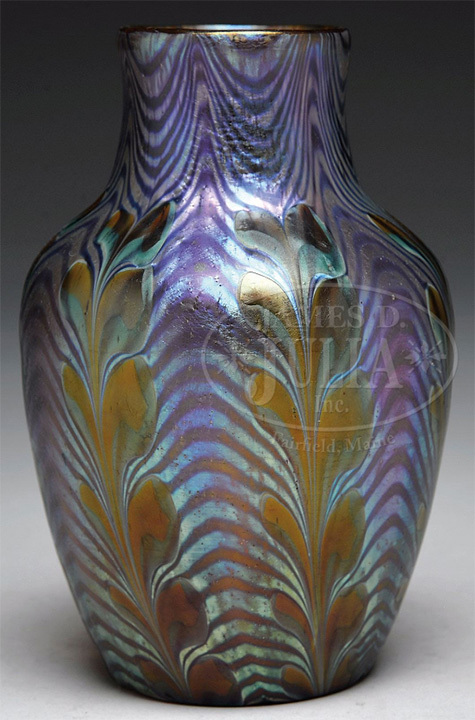 The sale totaled $2.1 million, with some assorted areas of strength, including Loetz glass and Tiffany Studios lamps. 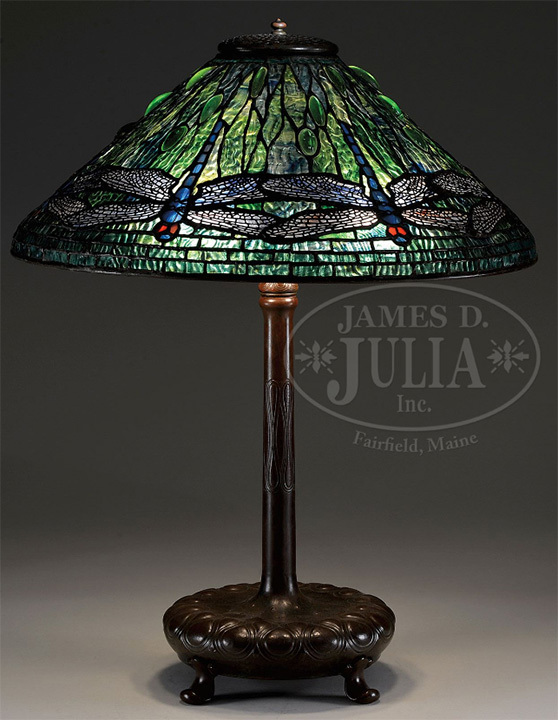 The top lot of the sale was #2350, a Tiffany Studios 20″ diameter Dragonfly lamp, with an unusual green ripple glass background. It sold near the high estimate, realizing $118,500. An important, monumental Daum Nancy blackbird vase was re-offered after failing to sell at the last auction. The estimate was lowered by $10,000, so it sold this time. Selling as lot #2084, it realized $30,800 — below the new low estimate, but above the reserve. If the original estimate had been lower, it would have sold the first time, probably at a higher price. Most of the objects in the auction that didn’t sell had too high an estimate and too high a reserve. 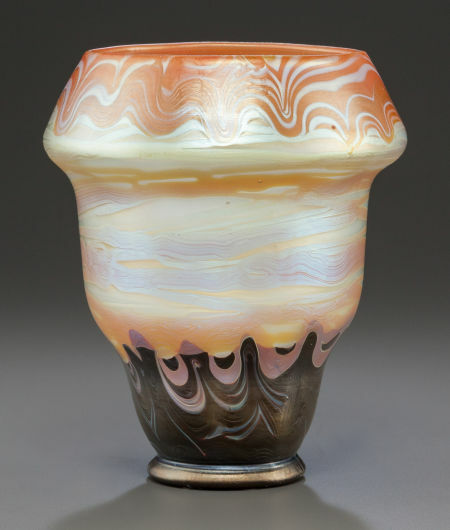 Most of the Loetz glass in the sale was from a private Connecticut collection. It was fresh-to-the-market and estimated reasonably, with commensurate results. Lot #1212 was the top seller of the group. It was a rare Phanomen vase, estimated to sell for $7,000 – $10,000. The final price of $11,257.50 was closer to the high estimate than the low estimate.